How to survive in Tomb Raider game? Brand-new Tomb Raider game is going to be wild and dangerous, so our young Lara Croft needs to turn into really skillful fighter to survive. The developers have prepared a lot of opportunities for our protagonist, and demonstrated the features of combat yesterday in the new part of Guide to Survival. First of all the developers announced stealth mode in the game. 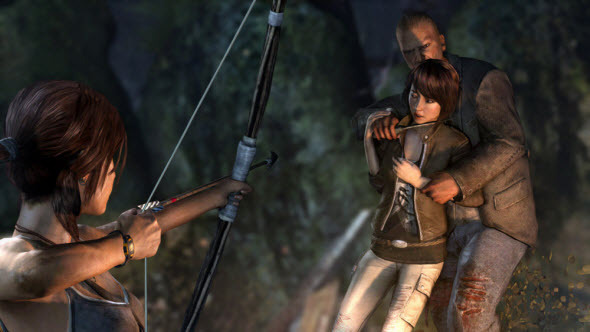 Lara will meet a lot of dangerous opponents on the island, so to win, she has to be not only strong, but artful. She should steal up to her enemies and hide, and also she can shoot an arrow at the wrong direction to distract an enemy and win a little time for the right shot. Also our young fighter will be able to use the environment during the battle. For example, she can shoot powder keg or lantern to make an explosion. But her opponents are good in making traps, so Lara should be very attentive. Also the official "real" Lara - the actress, who represents this beautiful raider, - was announced. Camilla Luddington - the star of Grey's Anatomy - will be the next Lara Croft. By the way, in our Facebook community we also have a lot of photos of voice actresses for Lara.